With TeamConnect's push-to-talk service, you can instantly reach your entire team! TeamConnect's push-to-talk application allows field workers, managers and work team coordinators to instantly communicate. Eliminate the frustration and delays of waiting on hold to reach your team! Drivers can communicate with one button push-to-talk and maintain focus on the road while adhering to safe driving. Managers can quickly view status updates and respond to critical issues. The reliability of TeamConnect eases the uncertainty of not being able to reach your employees when you need them. You don’t need to be at the office in order to communicate or connect with your workers. 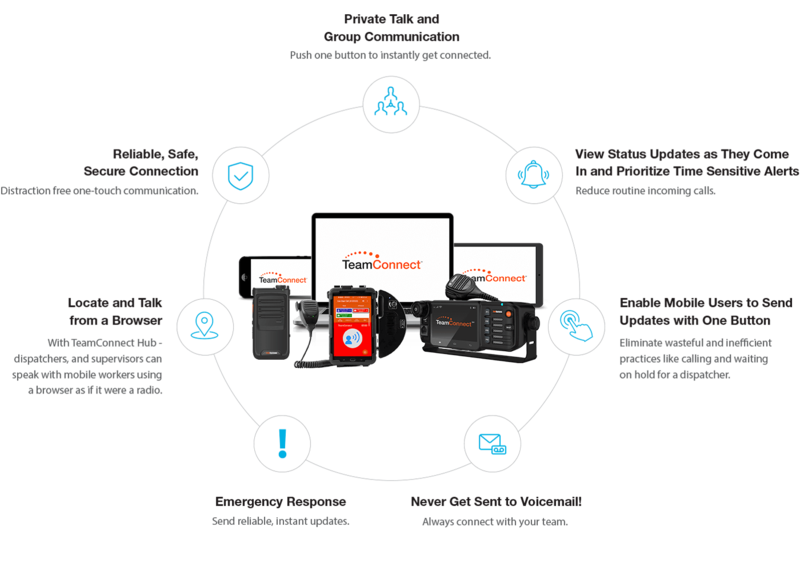 With TeamConnect – you can speak with your entire team from the comfort of your home or anywhere you choose! Additionally - when using TeamConnect Hub on your browser, you can identify where an employee is - click on their name and talk to them directly without the need to dial. TeamConnect gives you connection at your fingertips!